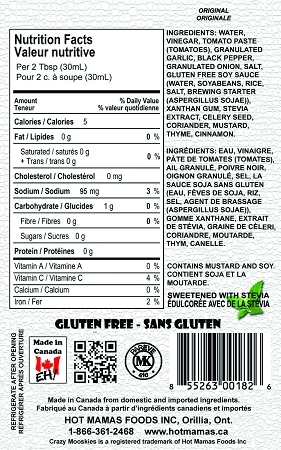 Canada's 1st Stevia Based BBQ Sauces! With only 1 g of carbohdyrates per 30 mL (2 Tbsp) serving, its the perfect alternative to other BBQ sauces. Lower in sodium also. Gluten Free-Vegan-Kosher Certified- No MSG and full of robust flavours! Sweetened with the natural source stevia! Perfect on steaks, chciken, fish, pork, vegetables or a dipping sauce for nachos and more! Original Flavour!